You are currently browsing the category archive for the ‘Marina del Rey’ category. Ever since Antica Pizza left the Marina, I’ve been in Napoletana pizza withdrawal. The nearest VPN (certified Napoletana pizza made with ingredients and methods approved by the association from Naples) was Settebello in Pasadena. I just couldn’t convince myself that the drive through down town traffic and then into Pasadena for pizza was worth it. I was thrilled when I saw that Settebello was going to come to the Marina in the same (newly rebuilt and redesigned) center that used to be Antica’s home. 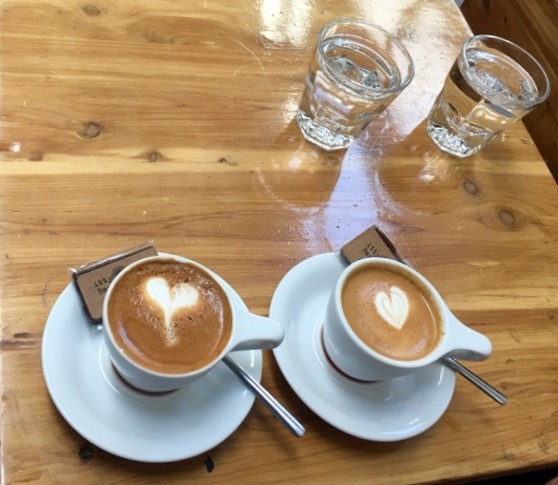 Settebello opened a few weeks ago and the space both inside and outside is comfortable and casual. Servers are young and helpful, even though the fine details of orders and specials haven’t yet been refined. One one occasion I was asked if I wanted peppers and Parmesan, on another not, whereas I was asked how many slices I wanted my pizza cut into, but on another occasion not. I also heard the chef explaining to the bartender what chard was and how it was spelled as he described one of the specials. The pizza that is the litmus test for a truly great Napoletana Pizza is the DOC Margherita, made with Crushed Tomatoes, Fresh Buffalo Mozzarella, Basil, Parmigiano Reggiano, Extra Virgin Olive Oil for $14, this 12 inch pizza is the classically simple staple for purists. This was a very good version, but it wasn’t as good as Antica’s. The flavor of the tomatoes needed a bit more zing (adding red peppers helped) and the crust, although perfectly thin and chewy, needed a touch more salt. Since I was not asked how many slices I wanted on this order, it was cut into four huge slices. The pizzas here are meant to be eaten with a knife and fork, so keep that in mind if you are used to thicker crusts that you can hold in your hands. I came back for another visit and since the signature pizza the Settebello, I ordered it and got Crushed Tomatoes, Pancetta, Wood Oven Sausage, Roasted Mushrooms, Toasted Pine Nuts, Mozzarella, Basil, Extra Virgin Olive Oil for $14. In this case the lack of salt in the crust worked well since the pancetta and sausage both had enough to create a great balance of flavor. This signature offering was great, a hearty yet refined combination of meat, cheese, mushrooms and the interesting crunch of roasted pine nuts. Whereas I easily ate the Margherita in one sitting, two slices of the Settebello (this was cut into six) was plenty for my lunch. 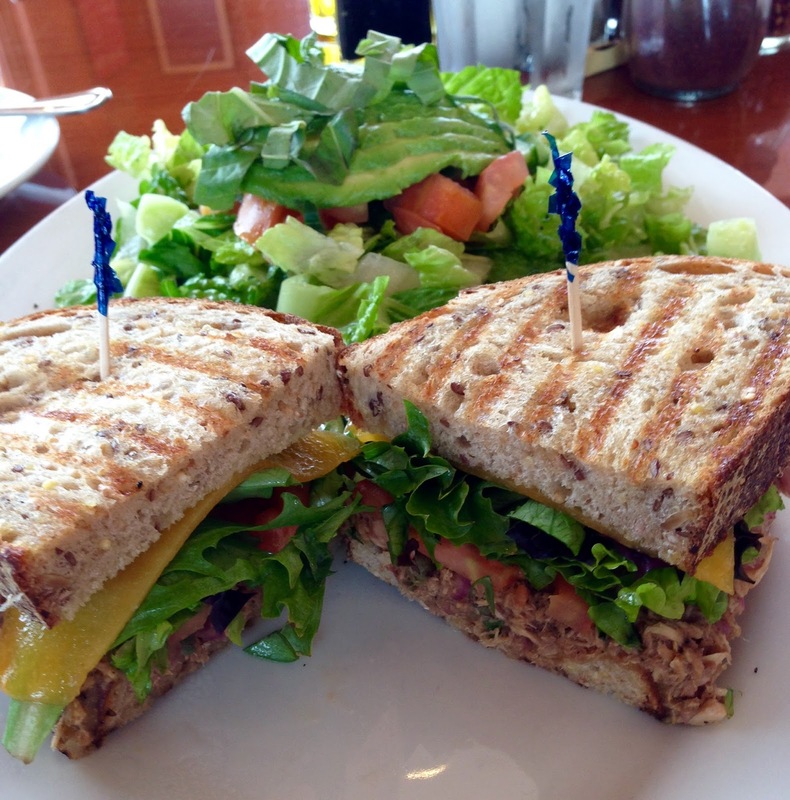 Sunny Spot is an aptly named eatery in Marina Del Rey with an expansive enclosed patio which allows glimpses of blue skies even during the grayest of Southern California days. Our weather this week has been overcast skies with temperatures that have hovered in the 60-70 Fahrenheit range. Fortunately the smiles and the Caribbean ambiance here would brighten even rainy days, and they have indoor seating if the rumor is true that it truly rains in Southern California. I am always impressed when the service team works together, but I am absolutely astounded when a manager steps in to take orders and clear plates. Matt, the manager during a prime time Sunday brunch came to take my order, gave it to my waitress, came back, cleared my plate, and asked how everything was, all with the grace of a symphony conductor who was filling in for one of the musicians in his orchestra, never missing a note. 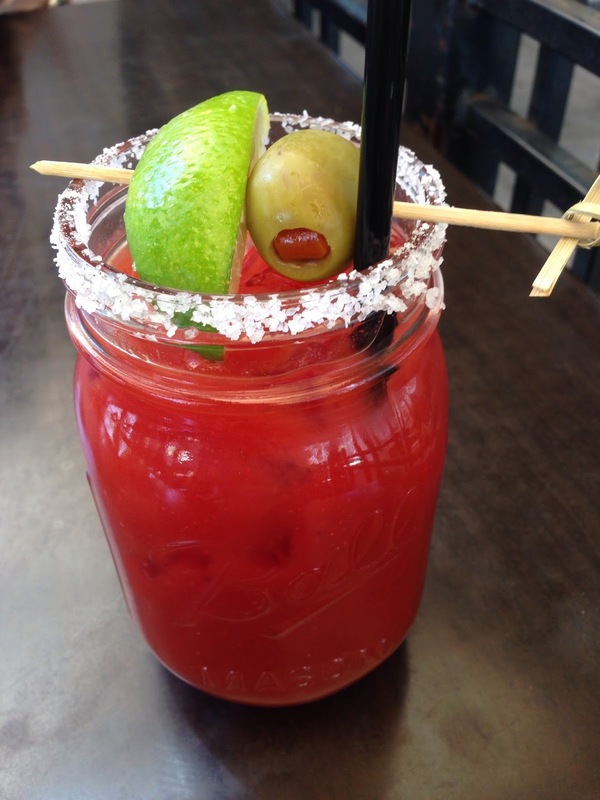 I learned that one reason that brunch is so popular is that they offer bottomless mix and match cocktails like Mimosas and Bloody Marys for $10, so people come and stay all afternoon. I tried a Bloody Mary and it was delicious, with enough spice and kick to rival another brunch hot spot, Joe’s, in nearby Venice. Although it was VERY loud, several people came with children in strollers, so this place is a kid friendly for brunch. 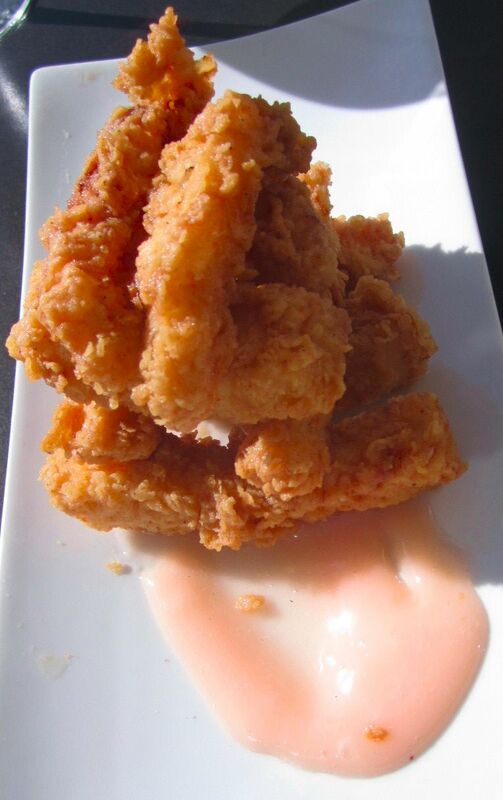 Hopefully the kids in the strollers all had a sober driver to get them home…..
My waitress recommended the “Cash Money Calamari” for $9 ($6 during happy hour) and when it arrived I was disappointed with the color, which made it look undercooked. It was perfectly tender and lightly salted, but for aesthetics I would have preferred a more golden appearance. The spicy cocktail sauce and lemon helped, but it lacked flavor that would have made it special. Since I wanted something spicy, and they are known for their wings marinated in habanero for $9 ($5 during happy hour), I segued on to their jerk wings. At first bite, I didn’t feel any spice, but as I kept eating the warmth glowed like an ember, a bit stronger with every bite. If you are in the least bit sensitive to heat, do NOT get these because although I loved the flavor, by the end of my second wing I was looking for some milk. If you love heat, go for these. They are not super crispy even though they are double fried, but they are not mushy or greasy either. The “one fisted” slider was adorable, about 3″ in diameter, on a brioche bun with tomato jam, arugula, cheddar, herb mayo, and the perfect bar bite at $3 during happy hour or you can get the “two fisted” burger for $13 which is “normal” sized. The brunch menu had a “Sunfire chicken salad” which is their Sunfire Salad, made butter lettuce, radicchio, arugula, cauliflower, grapefruit, goat cheese, a chili lime vinaigrette, made with the addition of jerk chicken for $13. This was my least favorite item because the jerk chicken was barely spiced, the greens were overly dressed, and it was not tossed well, with nearly all of the ingredients at the bottom of the plate under the lettuce. Because I ordered this during their Brunch and they were literally jam packed, I might try this again when the kitchen isn’t slammed. 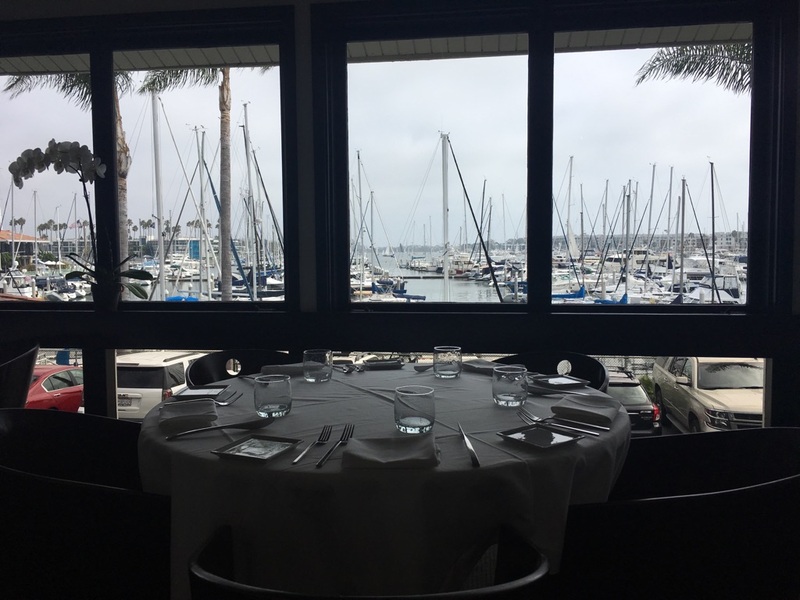 When the hostess, wait staff, bus staff, and manager all work together as a team during the height of a holiday brunch and manage to stay upbeat as they do their work, they bring a bright Sunny Spot to the gloomiest days in Marina Del Rey. I love eating with people who know and enjoy excellent restaurants. Those of us who have worked in restaurants, catering, or cook for our friends, know the skill and work it takes to achieve that elusive smile when excellence is attained. Very few places make it to the top of our dining list and even fewer stay there, but Locando Positano now has a place on our list and it looks like it will be staying. I had dinner with Katie, an 8 year old gourmet (her palate & sensibilities are more sophisticated than many 38 year olds), and her parents on a Blackboard Eats menu that included three courses for $35 (a glass of wine with dinner would made it $42, but instead of glasses, we ordered a bottle of Mozzini Rosso 2009 that was excellent). 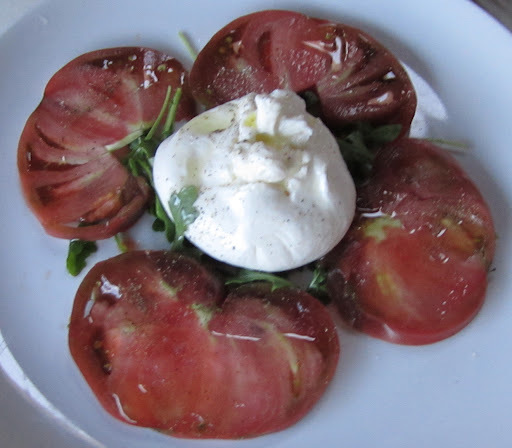 Janet started with the heirloom tomato and burrata caprese. This classic combination not only looked beautiful, but the tomatoes and burrata were as fresh and balanced a combination as I have ever tasted. 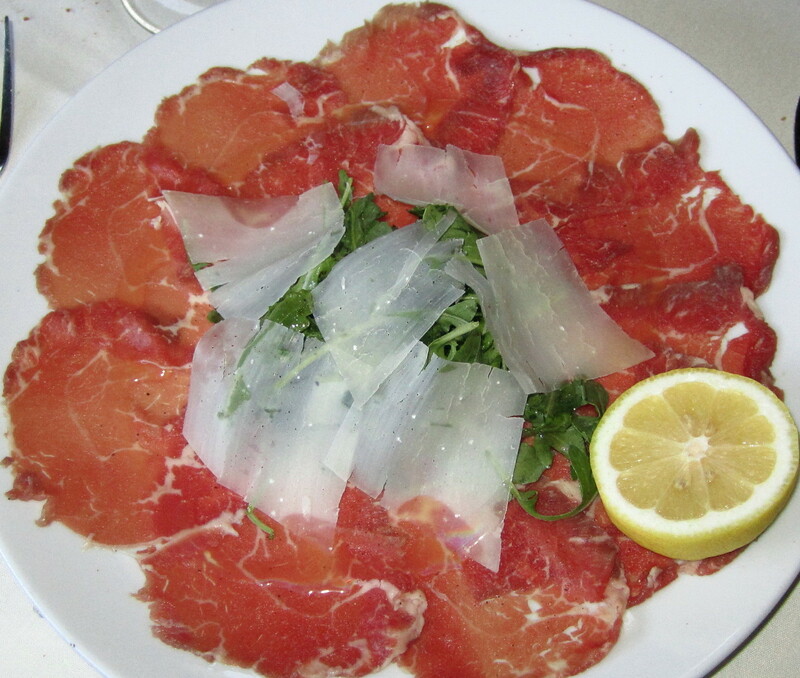 Bob and I had the beef carpaccio and we were both amazed by the quality of the beef, the perfect lemon vinaigrette on the baby arugula, and the proper ratio of parmesan to arugula and beef. 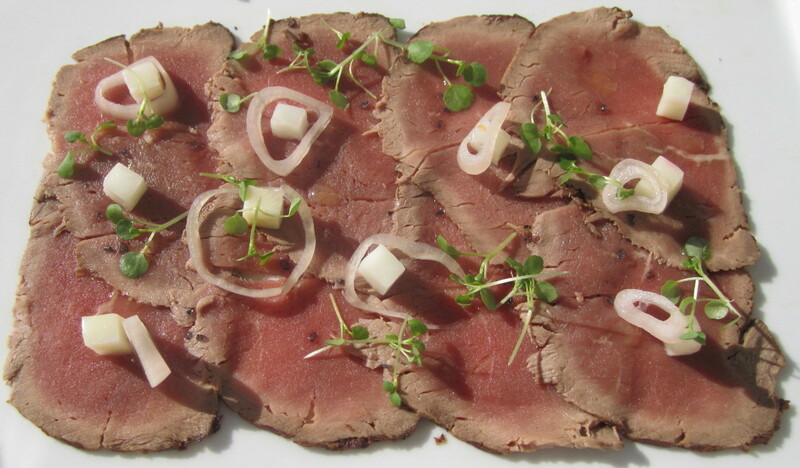 I would rate this as one of the best beef carpaccios I’ve eaten in years. 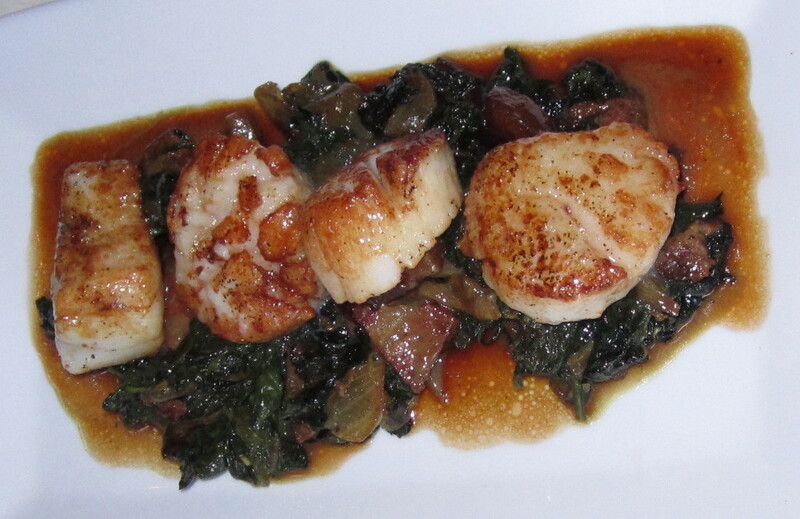 Bob’s main course was scallops over spinach with thick cut bacon and mushrooms. I wasn’t sure I could eat the scallops since I am allergic to farmed scallops, so I tasted the spinach and loved the rich combination of flavors. 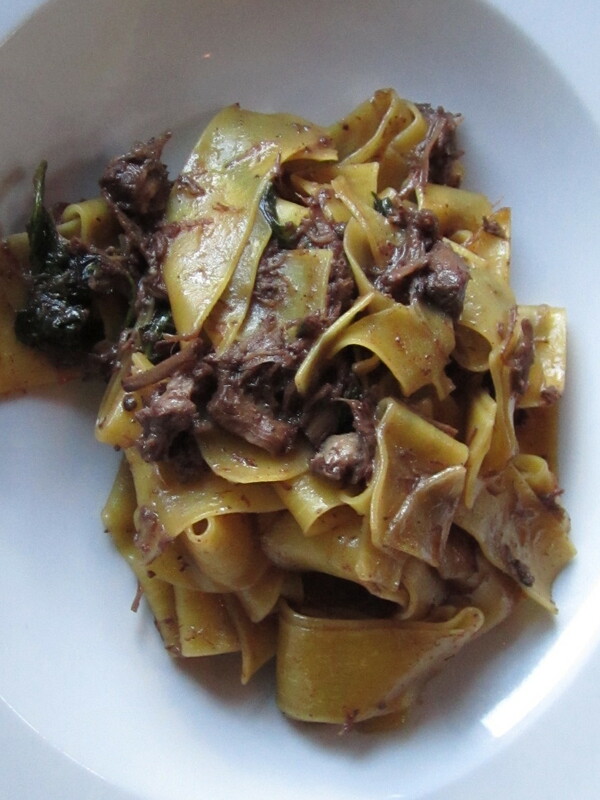 Janet and I ordered the home made pappardelle with wild boar braised in a Brunello sauce. 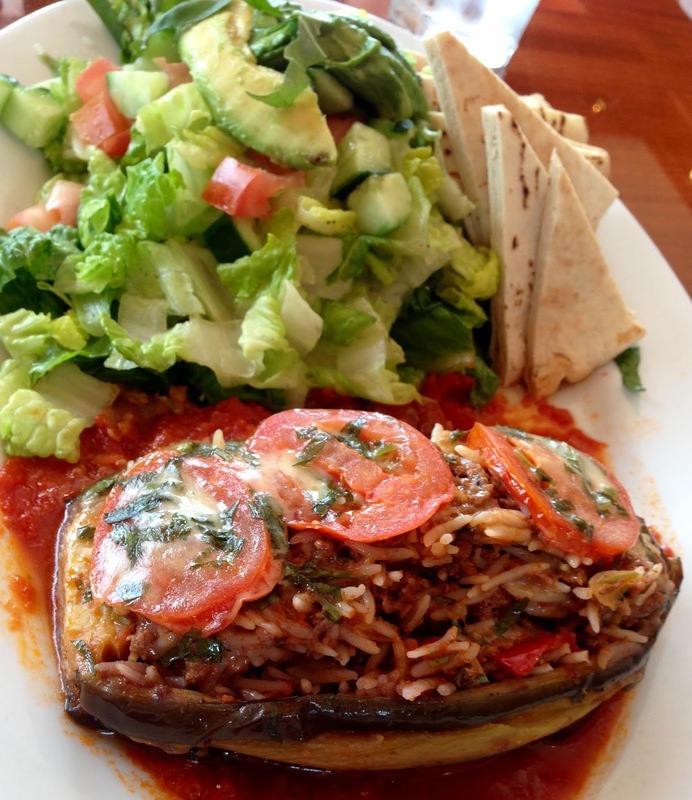 It was heaven on a plate. 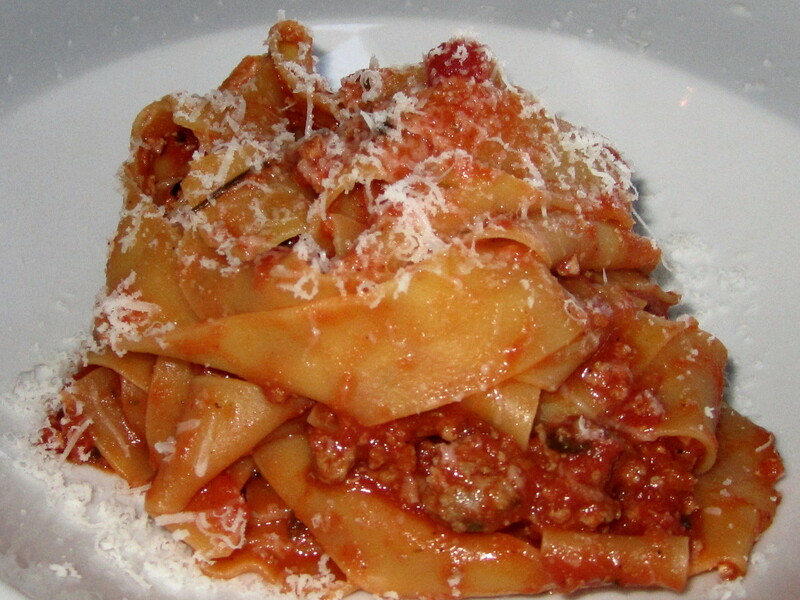 Perfect pasta with a perfectly braised meat. I could eat this everyday as my comfort dish. They were out of the lemon mousse, so we opted for the other dessert choices of the night. The only rating of “fair” to anything we ate went to the tiramisu, which we all agreed was a bit too “wet” and not very creamy. 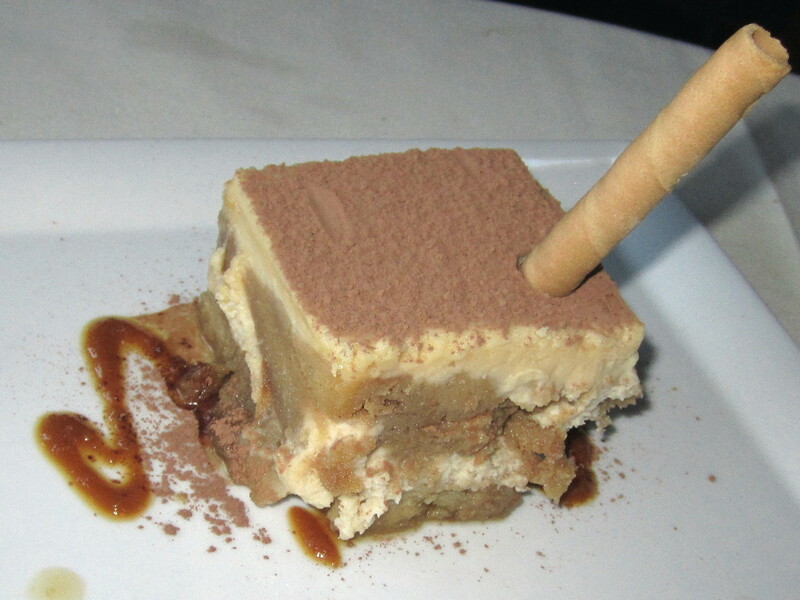 It was a fair rendition of the classic, but not a dessert we would reorder. 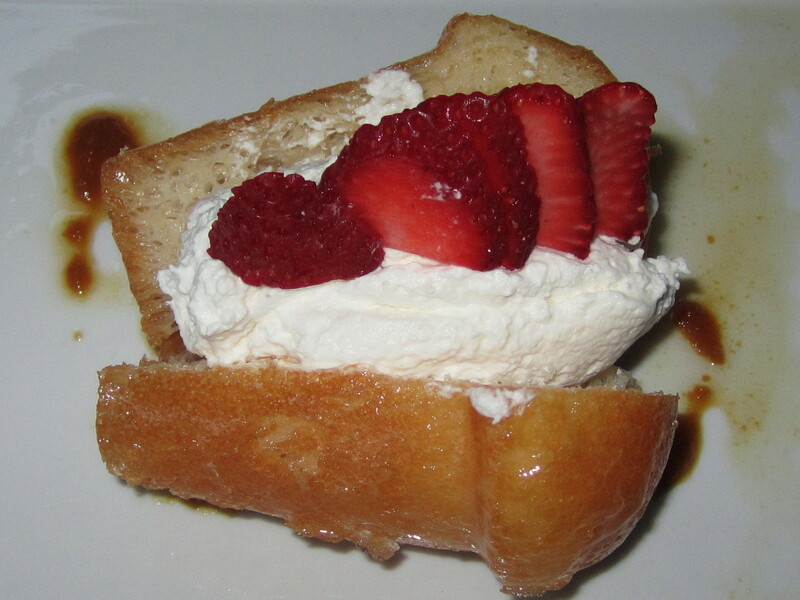 The baba was delightful, with a wonderful rum soaked spongecake as light as air, paired with freshly whipped cream and farmer’s market strawberries. 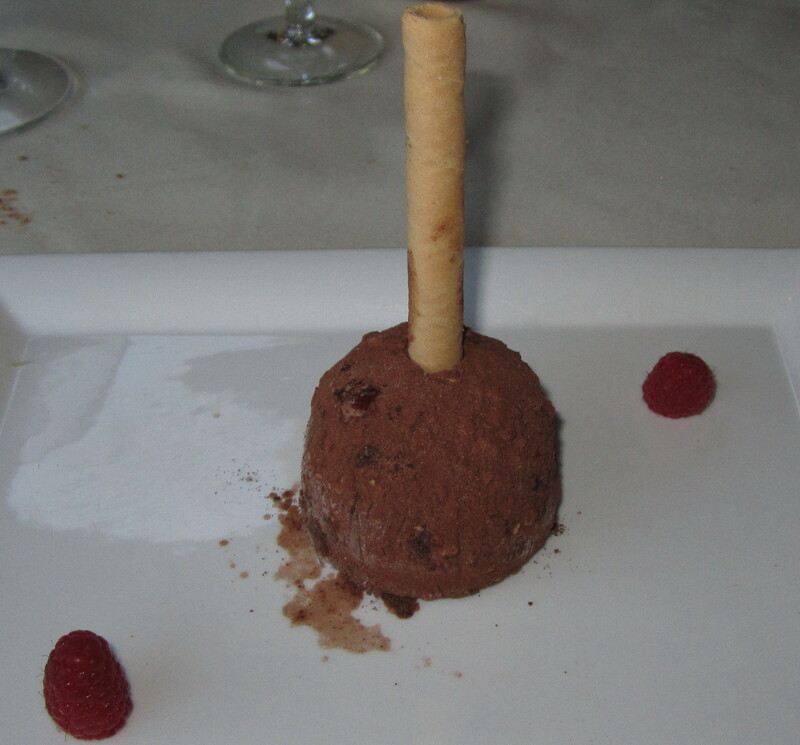 Katie & I both had the tartufo, made with gelato, rolled in cocoa powder and presented with farmer’s market raspberries and a rolled wafer cookie. We both finished our desserts! Whenever Cindy comes to town, we always try to experience a new place. 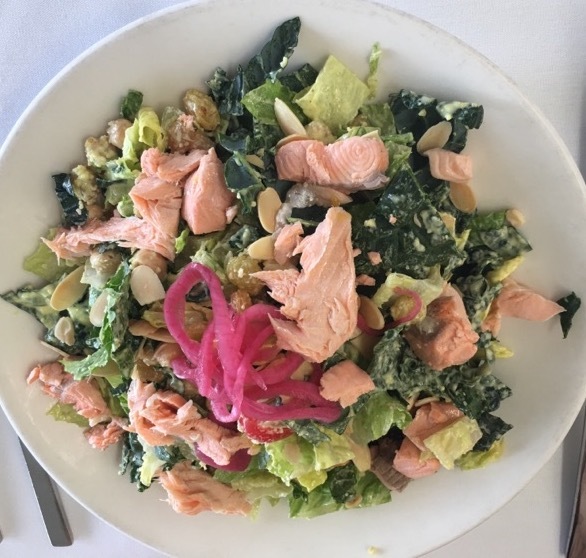 Today’s lunch was new not only for Cindy, but for me since Vu has just been remodeled and redone inside the Jamaica Bay hotel in Marina del Rey. Cindy had never been to the Marina, so I thought this would be a great location for her to see the small beach and boats that make up the charm of this area. With indoor and outdoor seating that takes advantage of the views from two sides, the remodel has made the space feel open and inviting at the same time. Warm earth tones and casual furnishings make this a spot you would want to live in, or at least hang out in for a few hours. It was a perfect Southern California beach day, so we opted for a sunny table which felt great for our later afternoon lunch. 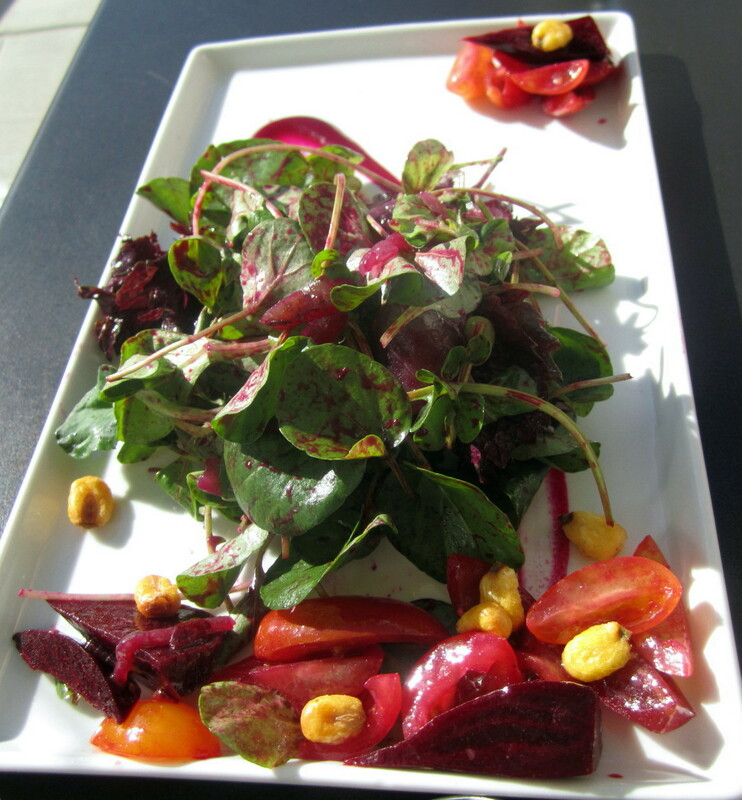 Cindy had the Vu Salad with roasted beets, mixed greens, caramelized red onion, corn nuts, baby tomatoes, beet vinaigrette ($9). The beet vinaigrette added some nice color and a slight sweetness to the tender greens and the corn nuts added a nice texture to this delicate salad. We split the Calamari and we were surprised by the tenderness of the thick sticks under the crunchy chicken fry; it was so good I could have mistaken it for Abalone. The calamari was so good by itself the pink lemonade sauce was unnecessary (I also found it a bit too sweet). We never did get a black peppercorn biscuit, but it was a great dish as it was served ($11). Being the carnivore, I had to order the Bison Carpaccio, which was mustard seared, and served with pickled shallots, celery root confit, peppercress, and extra virgin olive oil (which was lacking in my dish but I actually preferred it dry) $14. I loved the fact that this dish was on the menu and I loved eating it even more with the small contrasting bites of celery root confit and pickled shallots. I would come back here just for this dish. We wanted to linger in the sun at the beach, so we ordered a dessert to share, the French Toast with strawberry jam, maple syrup ice cream, strawberry & thyme relish ($8). Although Cindy does not like fruit (go figure), she liked the strawberries on this dish because they were cut up into a minuscule dice. The French Toast was just the right amount of crunchy and tender and the ice cream was a nice treat for those who like their desserts a la mode. Vu has a Happy Hour from 4-7 with bites for $5 (including a steak tartare) and drinks for $6 and on Sundays the do a reverse Happy Hour from 8pm-closing, so you might want to come by around sunset for a drink and a bite by the beach. Service was good and the setting was comfortable, and in spite of the few menu/kitchen discrepancies, the food was worth coming for, even though the place is in a hotel. Valet parking is free during the day (please tip your valet), so come and enjoy the view at Vu. I have been wanting to try Antica Pizzeria ever since I saw the twitter posts from @ChefLudo and @FrenchChefWife; when a chef and a pizzaphile (Krissy) both rave about a pizza, it’s time to go for a taste. Even better than their posts was the actual experience of both the restaurant and the pizza. 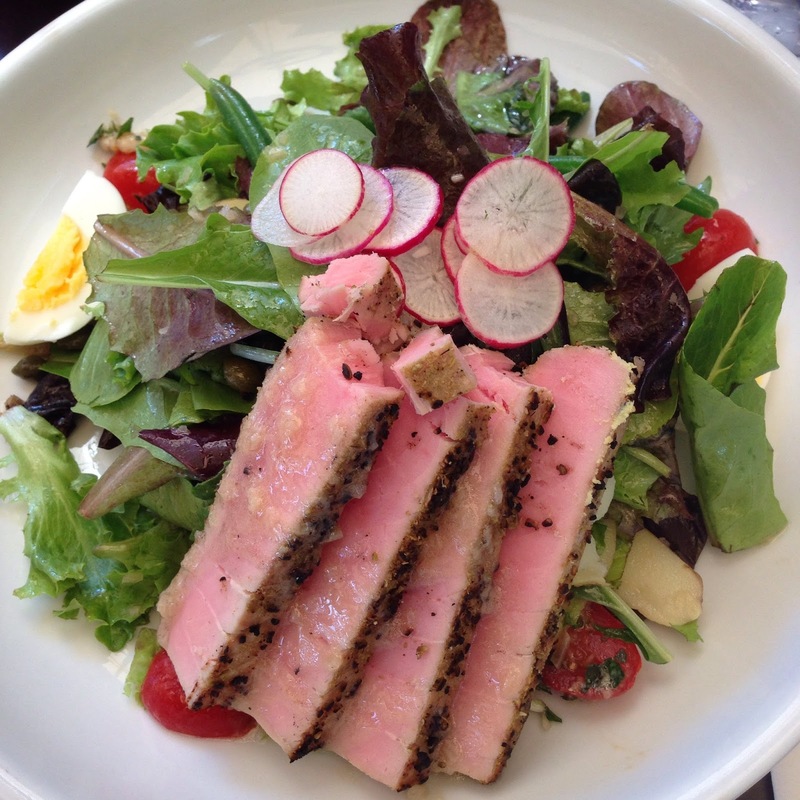 Antica Pizzeria has two locations in Los Angeles, one on Third Street and one in Marina Del Rey (where I went). Do not confuse them with Pizza Antica in the new Santa Monica Place Mall. 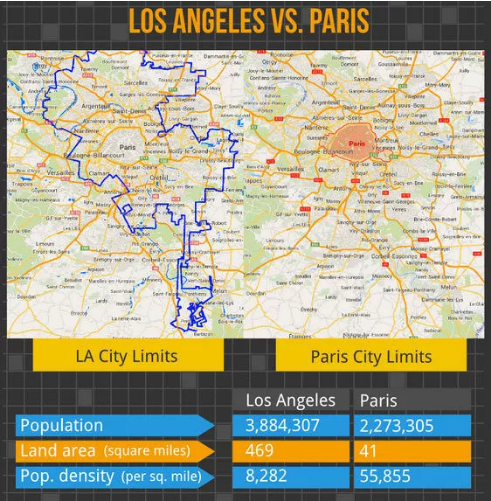 The major difference is that Antica Pizza has the one of the four VPN designations in California. VPN is an organization (Associazione Vera Pizza Napoletana) created to preserve and uphold true Neapolitan pizza. This designation makes sure that when you order a pizza from one of these establishments everything is done correctly, including the use of proper ingredients, like the flour (Tipo 00), San Marzano (plum) tomatoes, all natural Fior-di-Latte or Bufala fresh mozzarella, fresh basil, sea salt and yeast. Only fresh, all-natural, non-processed ingredients (preferably imported from Naples or Campania region, are acceptable), the manner in which pizza is prepared (no machine, not even rolling pins), cooked (wood burning ovens only), even the measurements of the circumference and thickness of the center. If you haven’t had pizza in Naples, this is as close as you will get to tasting it here in the US. 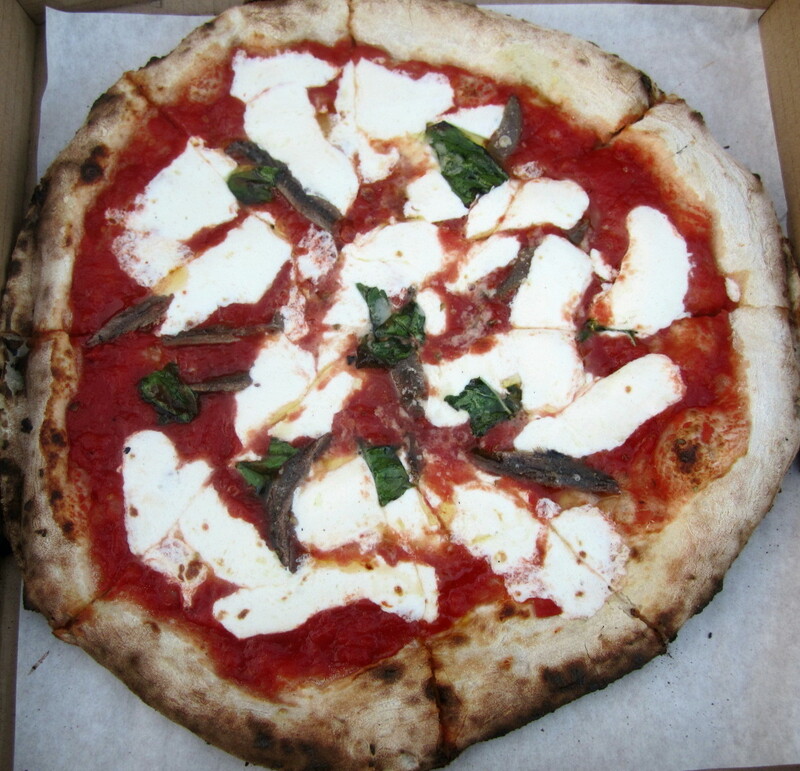 I ordered the Napoletana ($13.50), made with tomato sauce, fresh mozzarella, basil, and anchovies. 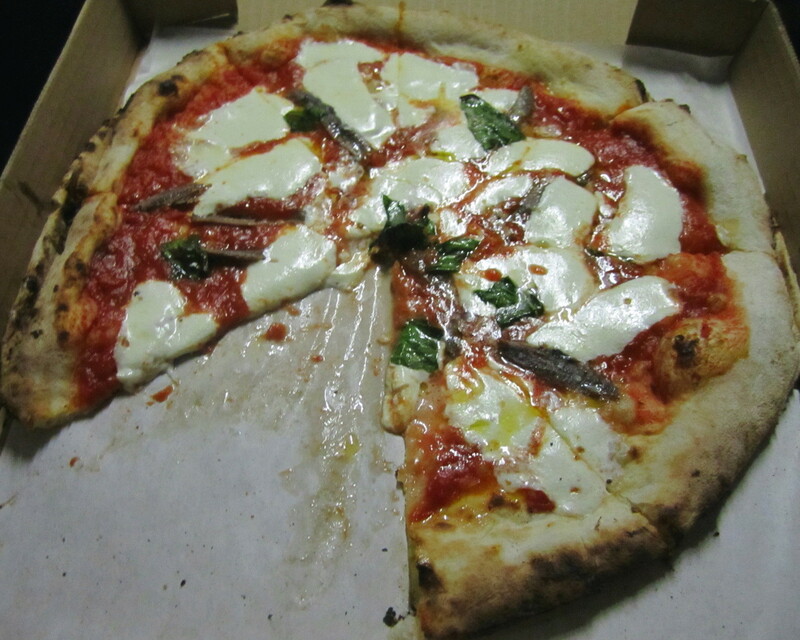 I know most of you shudder at the thought of anchovies, much less want them on your pizza, but it is so rare for me to even find anchovies on a menu that I had to order this classic. They offer 15 other pizzas ranging from a Pizza Blanca al Prosciutto ($14.50), made with fresh mozzarella and garlic topped with Parma prosciutto and arugula (no tomato sauce); Pizza Capricciosa ($14.95), made with tomato sauce, fresh mozzarella, basil, artichoke hearts, mushrooms, black olives, and Italian ham; or for those who can’t decide, Pizza Quatro Staggioni ($14.50), with a quarter section each of the mixed seafood, Margherita, Capricciosa, and Marinara. Since they make everything to order, it took about 15 minutes for my order, so I had plenty of time to peruse the many articles praising Antica Pizzeria from the Los Angeles Times to Saveur magazine. You can create a meal to go if you are in a hurry from their very nice take out section of prepared foods from Arancino di Riso (rice cones filled with peas, ham, and smoked mozzarella), to meatballs and lasagna. 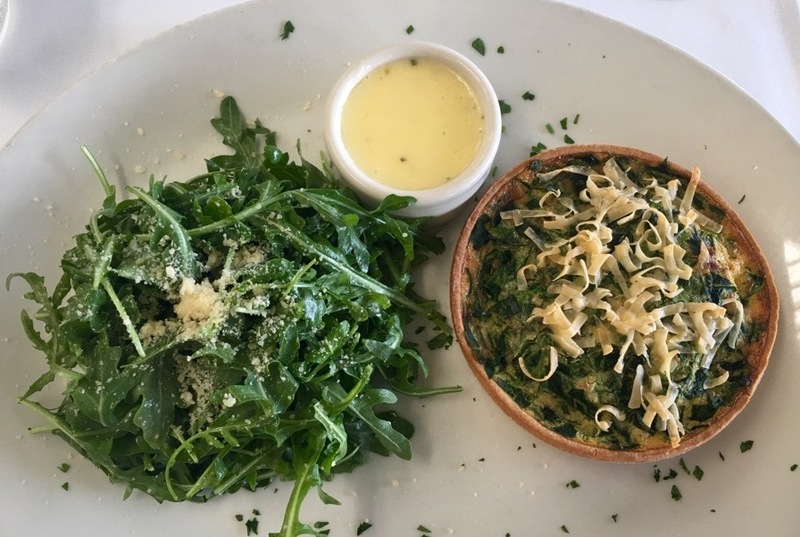 They also offer salads, pastas, rissoti, and freshly grilled specialties if you are not in the mood for pizza; nothing on the menu is over $24 and portions are generous. But I came for the VPN pizza and I could not wait to get the pizza home before trying a slice. I felt as if I was in Italy from the first bite; the tomato sauce had a perfectly ripe sweetness, the fresh mozzarella was melted just enough to warm it without making it bubble, and the basil and anchovy were sprinkled throughout with a measured hand, neither overpowering nor underwhelming the cheese and sauce. The crust was so tender and thin that I actually ate the whole thing (ask anyone who has ever seen me eat American pizza and you will hear “she never eats the crust”). Pizza dough made by hand with top quality ingredients and baked in a wood burning oven is a taste sensation rivaled only by the taste of freshly made baguettes still warm out of the oven from a boulangerie in France. If you don’t eat carbohydrates, you are missing one of the great joys of life, especially if you don’t taste the pizza here. I will be doing my best to bring everyone I know here whether or not they are going to see a movie in this complex on Maxella. Antica Pizzeria gives me hope that perhaps after tasting this pizza American taste buds will reject the processed disks they eat from other vendors. Once you taste something divine, you will never settle for less, and Antica Pizza is one of life’s pleasures,. What is the point of life if you do not experience pleasure?